Savoring another meatless Monday around here. Our Community Supported Agriculture farm (Spiral Path Farm) is up and running in full swing with two spring deliveries already. The weekly box of local organic veggies included fresh kale and winter harvested yams which are the main ingredients for this quick and easy African Yam and Kale soup. Delicious! Packed full of flavor, it uses a nice variety of spices (chili powder, garlic, cumin, curry, and cinnamon) to create a tasty broth for this soup. The recipe is from the Happy Herbivore, and can be found on her website, here. Oh yum! Preheat oven to 350 degrees. Grease and flour 2 - 8 x 4 inch loaf pans. Combine sugar and oil until well mixed. Add eggs, one at a time, incorporating until well blended. Mix in flour, baking soda, and salt. Gently mix in partially thawed and chopped strawberries and walnuts. Divide batter into two greased loaf pans. Bake for 1 hour, or until bread tests done. Slice bread into twelve slice, and then slice each in half, yielding 24 half slices. Optional serving method: Soften 8 oz. cream cheese, divide into two bowls, and tint pink and green with food coloring. Top each piece of strawberry bread with a petite rosebud. When I first saw this little flower all over the garden last year in late winter, I thought it was pretty. Having a flower bloom in late winter is fun! Little did I know . . . . . In the mustard family, this plant has a basel rosette that winters over, also called cuckoo flower, I can tell you it is driving me coo-koo. Blooms in late winter and is very pretty with a slightly peppery flavor. After flowering, it sets seed and those seeds are spring loaded and pop out and spread with a vengeance as I am learning this spring. Ugh!, another invasive weed, it has been around in milder climes for a while but has now popped up all through our area of PA as well. I grew up in a house full of houseplants. Our mother had plants in every room of the house. A touch of green here and there. She was well before her time. 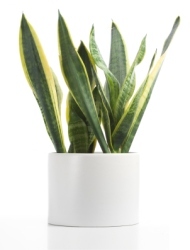 It has since been shown that houseplants help to improve the quality of the air in your home. NASA studies have shown that many common house plants will clean the air of pollutants such as benzene, formaldehyde, and trichloroethylene. This becomes even more important in our modern, energy -efficient buildings which are sealed and air-tight. The NASA study also showed that plants in the work place boosted morale and plants in a hospital setting reduced pain. There are many houseplants that can be grown and used in this capacity such as the Dracena's, Bamboo palm, English Ivy, Peace Lily and many more. We add other houseplants to this -- I have a citrus grove of orange, lime, lemon and grapefruit. I can't say I grow them for the fruit but the flowers are sooooo fragrant. And I love my other tropicals, Monstera, Foxtail Fern and more all soon ready to go outside for the summer. Some are extremely easy to grow such as Snake plant (left) which will grow in the least sunny corner of your home. Labeling your herb garden is sooo important. It is like wearing a name tag at the meeting, you know your name but the others who visit you may not. Over the years we have seen a variety of creative labels. Above are cute watering cans stakes that were turned into labels. I have seen the same done with a teapot shape for a herb tea garden. This is a homemade wooden stake that was painted white and the name is printed on with a thick Sharpie brand marker. The boards can be cut to varying heights so that the tall ones can be used with tall dill or fennel plants and thyme can have a shorter label. If you don't have access to wood boards, white mini-blinds can be recycled and used as a plastic label and again cut to varying heights. Roofing slate, Rocks, wood stakes, pottery pieces the choices are endless. This pottery style is what we sell in The Rosemary House. With over 75 names available it is easy to label your whole garden with these pretty labels. This charming label below was used to decorate a children's garden in a community garden. Of Course, this is the ultimate label, with lots of information. Preparations are underway for the Earth Day celebrations in downtown Mechanicsburg this Saturday, April 20th. Be sure to head to Mechanicsburg for an exciting day of music, kids activities, vendor exhibits on Main and Market Streets. While you're downtown, pick up your herb plants at The Rosemary House after stopping for lunch at Sweet Remembrances! The tea room will be open for walk-in table service. We will be serving lunch to include wraps, an Afternoon Tea platter, and sandwiches. Hot pots of tea or iced tea will be available. It looks like a fun day! 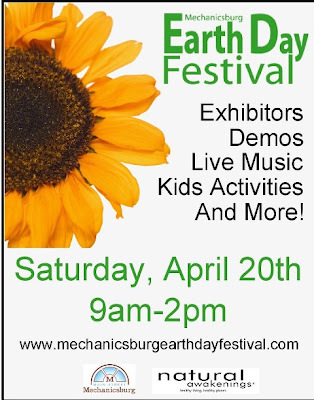 Visit Mechanicsburg Earth Day Festival for more information or 'Like' the festival on Facebook! In preparation for the Tea With the Parlor Maid event, the silver platters, serving utensils, footed compotes, and tea strainers were all polished and placed on display. This three sectioned tussie mussie arrangement holder is not an antique, but is certainly fun to put into use! It holds a minuscule amount of water, so it's a last minute thing to tuck the flowers in there so they will remain fresh through the party. All the silver pieces displayed on the oak side by side in the tea room foyer are from my mother's collection. My personal collection of silver tea strainers was polished to a sparkle for this event. These were collected over the years, and have been enjoyed for their simple beauty. The staff, holding the newly polished silver teapots, and dressed for the event. Our first Parlor Maid tea was Sunday April 14th, the second is scheduled for the 28th. Hopefully we will be able to snap some photos of the food presentation at the next tea. Preparations have been underway for our Tea With the Parlor Maid event to be held this Sunday, April 20th and also Sunday the 28th, both events sold out quickly. The downstairs staff will be suitably outfitted with these pristine white aprons that were stitched last month. Little scraps of material were used to craft small caps to complete the outfit. Black shirts and long black skirts will round out the attire. We are all looking forward to dressing up for this fun afternoon tea as we entertain the upstairs clientele. Judy Larkin, the Tea Lady will present a program that will explain why tea was an integral part of life for the working class. Dressed as a parlor maid, she will share the rules and hierarchical relationships that governed servants lives in the late-Edwardian era England. She will also discuss life 'below stairs' where there were plenty of opportunities for merriment. This is a quick and easy dip to serve with fresh fruit. It would also be quite suitable to serve with scones. Combine cream cheese and marshmallow until creamy and smooth. Gently fold in the freshly zested orange peel. Chill. Serve with your favorite fresh fruit. Is it a Tea pot? or is it a Fairy House? Nestled among a variety of mint plants is this adorable little fairy house ... the latest addition to our spring time inventory at The Rosemary House. 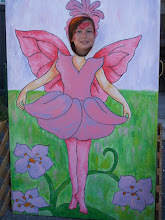 It would surely attract tea drinking fairies to the garden! Fun! A gift from a friend... Thank you, JY! Will continue drinking tea in an effort to remain calm! My penpal Mikako shared this tin of Xihu Longjing green tea with me. She told me that her husband purchased the Longjing in Hangzhou, China while on a business trip. Her husband travels to Hangzhou every year with city members as there is an amicable relationship between her town of Iwakuni-city, Japan and Hangzhou-city, China. Upon opening the tin and the tightly sealed foil bag, a fresh green fragrance emitted from the package. The broad flat tea leaves captured my attention, along with the mottled green color. Xihu Longjing translates to West Lake Dragonwell tea. Typically, only harvested once a year in the spring, it is a pan fried tea. Once brewed, the tea leaves maintain their original shape as noted here. The leaves on the left are dry, while the tea leaves on the right have been steeped at 180 degrees for 2 minutes. The color and shape of the leaves are almost identical. The pale green brew is delicate in flavor and quite enjoyable. An added plus, you can enjoy multiple steepings using the same leaves. Additional information about Longjing Green tea can be found on Wikipedia where it is suggested that the tea leaves can be eaten after brewing. Something new has been added to the tea room shelves! Can you spot it? Good things come in pretty packages... and this pretty tea and gardening themed wrapping paper held a special hostess gift for us. Friends of the family joined us for Easter dinner this past weekend, and in addition to a rather tasty blackberry dessert wine, a hand crafted treasure was gifted to us as well. This lovely framed, one-of-a-kind picture fits perfectly in the tea room. Handcrafted using a colorful assortment of vintage buttons to spell out the word T.E.A., it is a fun addition to the collection. Thank you so much to D. and R. for your thoughtfulness. We treasure your friendship and all that you have done for our family over the years.